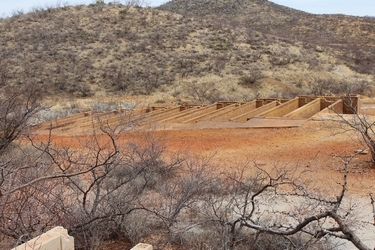 Courtland is one of the best known of Arizona's Ghost Towns. It is located at the southern end of the Dragoon Mountains at the edge of the Sulphur Springs Valley. With the discovery of copper in the early 1900's, the town grew very quickly to a population of 2000. In its heyday, there were stores, hotels, two newspapers, an auto dealership, and a movie theater. Two railroad companies provided service to the area. A post office was established in 1909. It was only a few years later, however that the copper ran out and the town began to go bust. Although the post office was maintained until 1942, the town was essentially abandoned by 1921. I originally ventured down to the old town to try and locate an area associated with a 1927 Sanborn Fire Insurance Map that I had come across. I was curious what, if anything remained of this section of the town. More information about the Sanborn maps can be found here. The colors used on the maps indicate the nature of the construction materials used. Blue=concrete, Red=brick, Yellow=wood frame, Gray=iron clad. It appears that in 1927 most of the buildings were vacant. The city jail was not being used. One of the commercial buildings was in use as a private dwelling(D). Businesses in operation were a Grocery & Confectionary that offered gas and oil, and there was a barbershop. Only the foundations of the brick buildings that were across the road from the City Jail remain. Except for a few rock edged leveled areas, all else is gone. There is almost nothing to indicate that this was once quite a highly developed "downtown" area. As can be seen in this photo, downtown Courtland today is pretty empty. This 1920 photo is of the area shown in the 1927 map and the modern photo above. Quite a different situation from today! The building in the center is identified as "Renaud's Store". C.M Renaud was a leading businessman of the early town. The brick buildings depicted on the map and whose foundations remain appear to the left. That the town was in decline even in 1920 can be seen by comparing that year's photo to this one from 1909. Renaud's store can be seen in the collection of buildings. Neither the brick buildings nor the jail had been constructed. An interesting feature of downtown Courtland that remains is the sidewalk that the customers and window shoppers once strolled in front of the brick buildings. There is a break mid way along the sidewalk. The opening can be seen in the 1920 photograph. It is in front of the 4th building. On the 1927 map, that building is represented with an "X". The "X" was used by the mapmakers to represent a stable. Horses didn't have to hop over the walkway to get out onto the street. A question about downtown Courtland that I have is , "What happened to all of the bricks?". There are almost none at the site today. Apparently as the town declined, buildings were moved or dismantled to be used elsewhere. The most well-known structure in Courtland is the old jail. It was constructed around 1909-1910 of re-enforced concrete. Today, it is in serious dis-repair. Some of the metal parts were apparently removed in the 1930's for a jail in one of the nearby towns. There were two cells to the facility. The jail in Gleeson which is essentially identical to the one in Courtland was recently renovated. Just to the west of downtown Courtland near the old Mame Mine is a set of interesting concrete structures. For those of us who grew up around modern copper mining operations the sight of all of the old tin cans lying around indicated to us immediately what these structures were about. They were part of a copper precipitation process called "Copper Cementation". 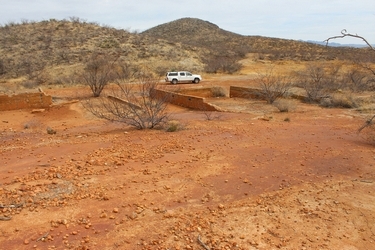 Copper precipitation was the not the mining technique used in the original days of the Courtland Mines. These structures are from "modern" times. 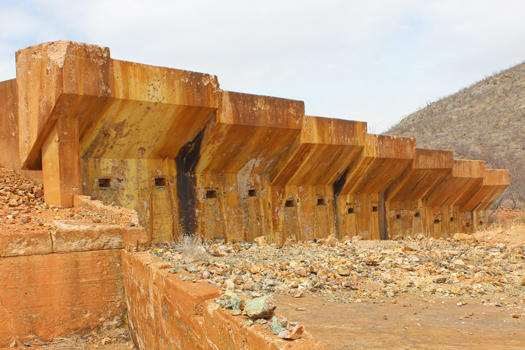 This operation was conducted by the Paramount Mining Company during the 1960's. 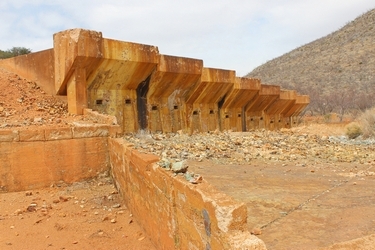 The seven cells, each with two sections, were constructed in 1960. The cells were filled with shredded tin cans. Sulfuric Acid mixed with water taken from one of the shafts was sprayed onto drill holes over the old mine stopes. As the solution percolated down through the rocks of the old mine, the remaining copper was leached out. The resultant copper sulfate solution was pumped out of the mines onto the tin cans where the copper precipitated out. The cement copper was loaded onto trucks and taken to the Inspiration Plant in Miami to be refined. In the mid 60's, there were as many as 7 employees working 3 shifts per day. 16 tons of concentrates were shipped a week with a value of 70-85% copper. It is unknown why the operation shut down, but it had closed by 1968 or so. This website does a great job of identifying the other ruins to be seen in the Courtland area. They are located in the southern portion of the town known as the Great Western Townsite. These photos are two views of "Big Rock Store" named by John Rock. At one time, this was apparently the largest store in town. The two buildings on the hill side were the offices of the Great Western Copper Company. 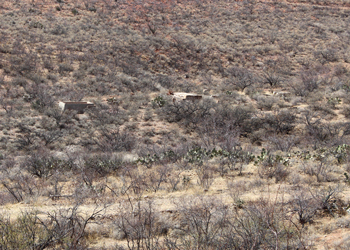 This ruin may have been the general manager/mine superintendents's house. 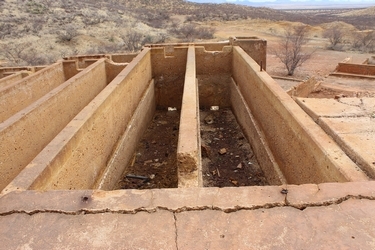 The website referenced above indicates that the concrete foundations seen out in the valley at the lower townsite may have been associated with the power house.